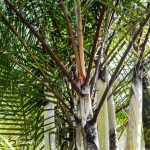 This will be the first post in an ongoing series that will be dedicated to palm tree growing tips. 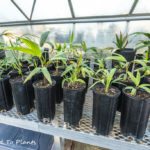 I remember back when I first started growing palm trees and tried doing research on the subject, a lot of the advice I am going to share wasn’t readily available. Much of it I had to experience on my own. Over the last ten years I have learned quite a bit through both trial and error and by having such good friends that have been growing palm trees much longer than I have. First up in the series of palm tree growing tips: Mounding. 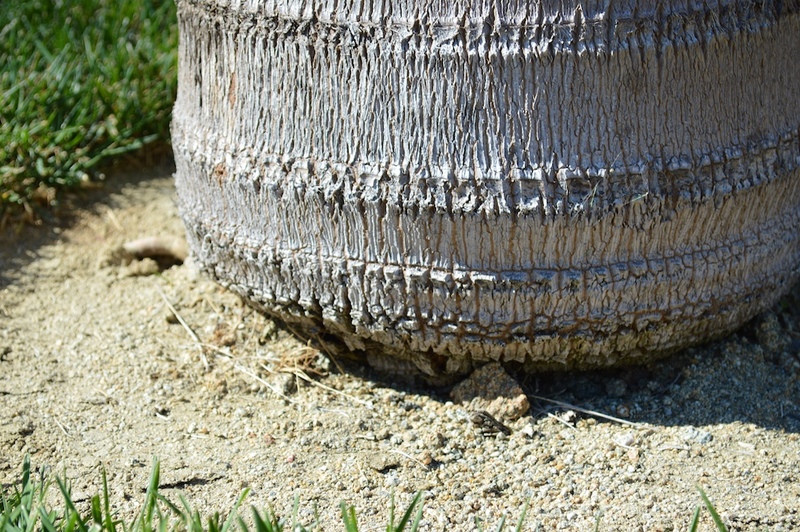 I define “mounding” as the method of adding a moisture-retaining layer around the base of the palm tree to stimulate new root growth and protect new root initials that will develop. The desired outcome with mounding is to create a larger, more robust root zone, which proves crucial to a palm tree’s overall health. A larger root zone will also vastly improve drought tolerance in your palm. I recognize two defined instances with palm growth habit where mounding is needed. What I consider to be the exemplar of palm growth habit in Mediterranean climates is when no palm roots are exposed and where the base of the palm is wider than the stem above it. It is to this example below that we should strive. Before I can discuss the concept of mounding, a little understanding of palm root biology is needed. To start with, all palm roots are adventitious. Simply put, this means that they grow directly from the stem rather than from other larger roots like in most other plants. This adventitious root system is made up of numerous nonwoody, primary roots that grow directly out of the base of the palm trunk in an area that we call the root initiation zone (RIZ). The root initiation zone is actually a restricted area. No roots can form above an indeterminate point on the stem, and palm trees can not create new primary roots from older, larger established roots below it. Having insight into the RIZ is key to understanding the method of mounding. Palm roots emerge from the stem at their final thickness. This means they are incapable of any secondary growth like you find in most other plants. Most palm tree roots do branch, but remember that the primary root can not expand. This is one of the reasons a palm tree won’t crack your sidewalk like a Ficus tree will. The roots you see in the photo below will never get any fatter. 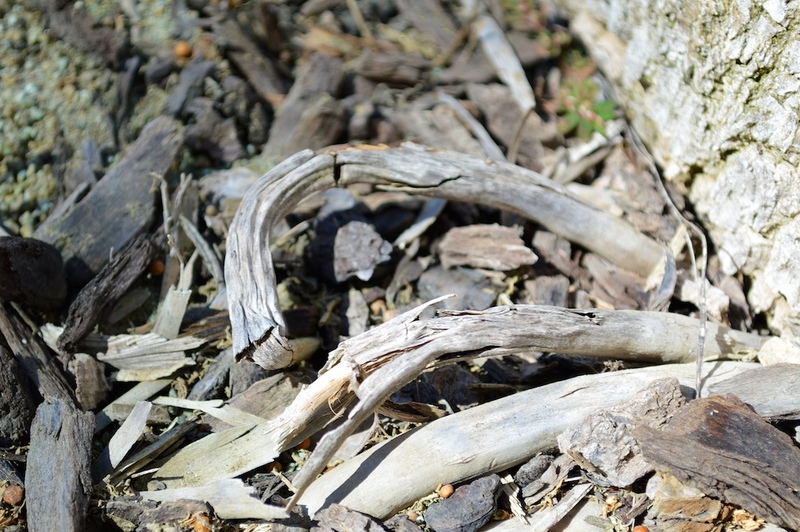 The stub of a new root that emerges from the RIZ is called a “root initial.” If these root initials are in soil or some other moist environment (compost, mulch, leaf litter, water) they will continue to develop and grow into functioning roots that the palm tree needs for water and nutrient uptake, plus stability in the ground. Because Mediterranean climates have dry periods and/or low humidity, keeping these root initials “wet” is much more important than if the palm tree were growing in a wetter environment. Some palm tree species actually have root initials that will develop from the above ground part of the RIZ. An example of this phenomenon can be found on older Canary Island Date Palms (Phoenix canariensis) like below. In these two Canary Island Date Palms above, this mass of aerial root stubs (inactive root initials) did not come in contact with the soil, so they became arrested. 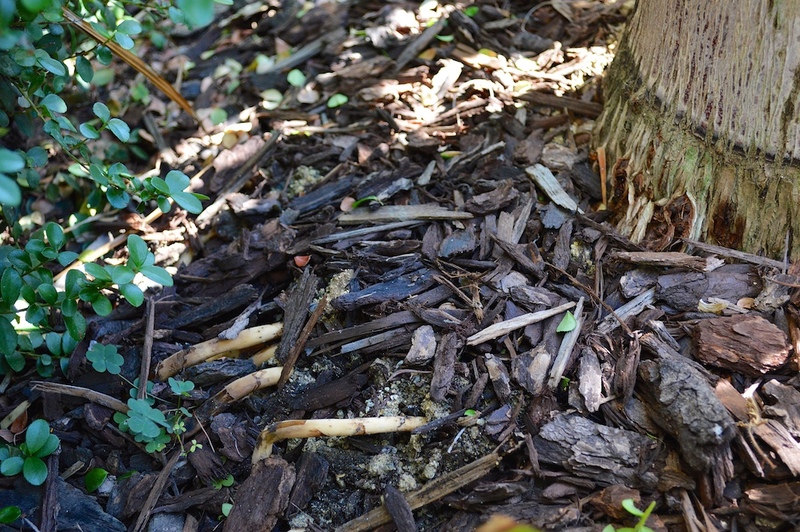 However, if you threw some mulch or soil over them, they would become active again and start growing. Now that you have an understanding of palm roots, I can explain the mounding concept and its importance. 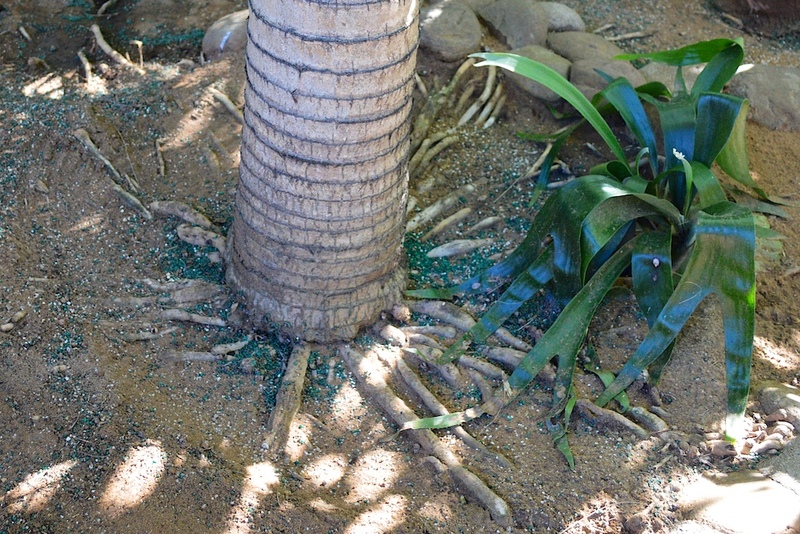 Earlier I told you that I describe mounding as the method of adding a moisture-retaining layer around the base of the palm tree to stimulate new root growth and protect new root initials that will develop. When you mound, this moisture retaining layer you are adding can include things such as native soil, mulch, compost, sand, rock or straw. Which you choose depends on two factors: 1) If the palm tree already has visibly active or inactive root initials showing, or has exposed roots showing, you can use a heavier option for the mounding layer like native soil or compost. 2) Plants that are air-girdled should have a more airy and faster draining layer mounded around its base. Something like mulch or decomposed granite (DG) will work great. When in doubt on what to use, err on the side of a faster draining option. 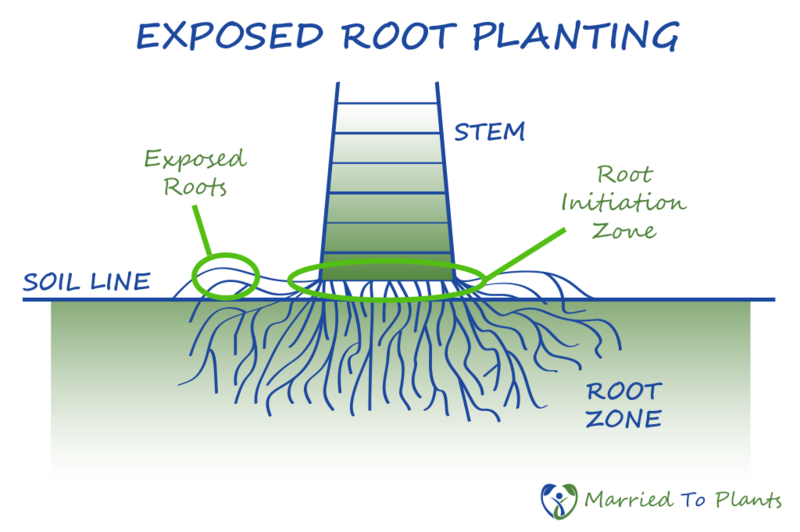 The first infographic diagramed an “Exposed Root Planting.” This basically means that anytime you have a palm tree cultivated in your yard and you see exposed roots or root initials, it is not an ideal growing condition. Some palms are stilt-root palms and in that case this would be irrelevant. However, in a Mediterranean climate there are maybe only one or two stilt-root palms that grow here, so I wouldn’t worry about them. 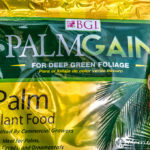 The bottom line is that palms want to have their roots covered—whether it be with mulch in cultivation or leaf-litter in habitat. Some palm trees, like the Canary Island Date Palm for example, come from drier areas so the root can handle being exposed. However, many palm trees do not come from dry environments and when their roots or root initials hit dry air, it can cause them to stop growing or even die. Below, this Ravenea rivularis in my garden shows how exposed roots and root initials became damaged when not protected from the environment. In this case, direct sun and low humidity were the causes of the damage and death of many of the roots shown. However, damage can also come from gardening tools, foot traffic or other means. 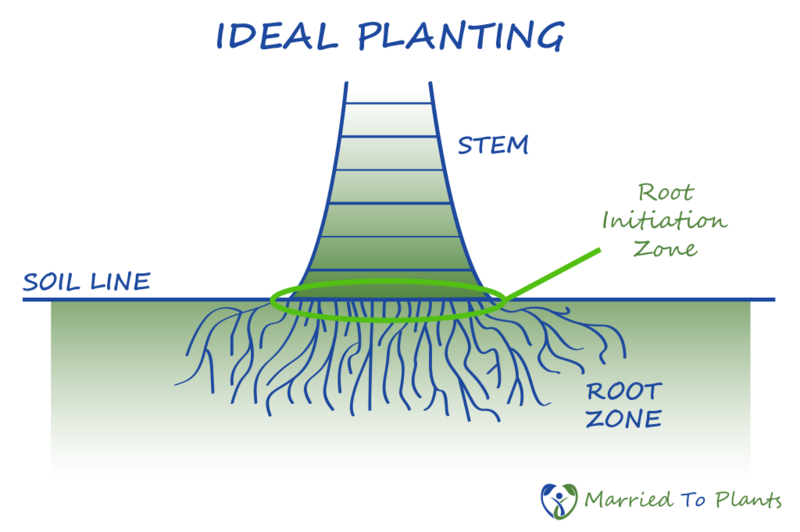 Mounding an “Exposed Root Planting” not only helps generate more roots from the RIZ, but the added protection from injury also helps with overall plant health. Anytime a plant is injured it greatly increases its chances of picking up a pathogen. 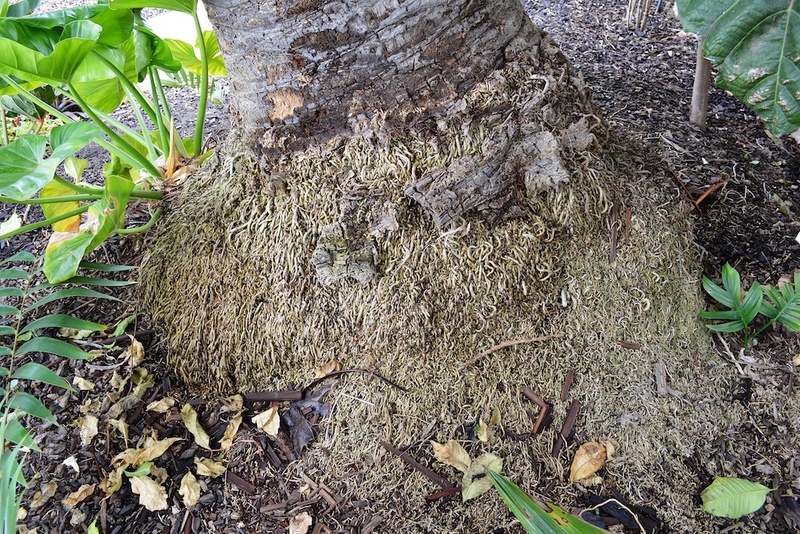 Fungus loves entering palms through damaged roots and trunks. In fact, some of the worst palm fungus like Fusarium wilt, Thielaviopsis trunk rot and Pink rot enter palms through injuries. 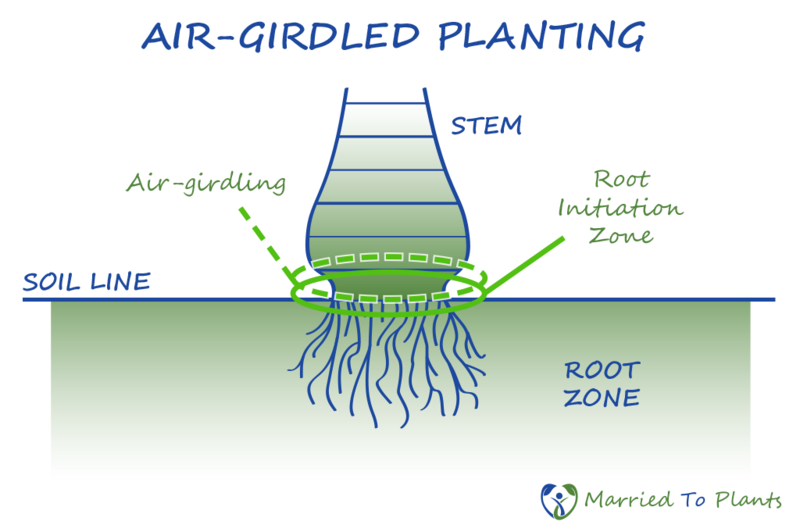 The second infographic from above diagramed an “Air-girdled Planting.” This is a term I coined describing the phenomenon in palm development where the stem of the palm grows fatter than its base found at the soil level. The palm tree will actually display a pinched (girdled) look to it. Some species of palm trees growing in Mediterranean climates will actually not send out any new root initials due to the fact there is no moist area for these new root initials to develop into. However, while the palm may not be pushing out any new roots to fatten the base of the stem, the trunk is still expanding above the RIZ. This is mostly seen in the more tropical palms that we grow, where the palm tree is planted a little too high above the soil line. Because of this, much of the RIZ is actually above ground. Here we see a slight air-girdling of a Roystonea borinquena found in my yard just before I mounded it. You can see a slight pinching of the base at the soil line. I believe that most palm trees will not send out new root initials because the tree knows they can not develop while exposed to the environment. It is our job to alleviate this, and mounding does just that. Mounding increases the moisture-retaining layer to a height where we guesstimate the top of the RIZ is located. Once the palm has been mounded it will quickly provide the right environment for new root initials to develop. By bringing the moisture-retaining layer up, you have also increased the surface area from where the palm roots can grow. The red line in the picture below of my Archontophoenix alexandrae illustrates the larger surface area where the new soil level would be mounded above the current soil level (blue line). The height of your mounding will depend on the palm tree on which you wish to initiate additional root development. A palm tree with visibly active or inactive root initials showing, or one that has exposed roots showing, should be mounded two inches above the visible root line. For air-girdled palms you should mound up to a point just below where the girdling first appears. The red line in the photos above and below represents the height to which you would mound. 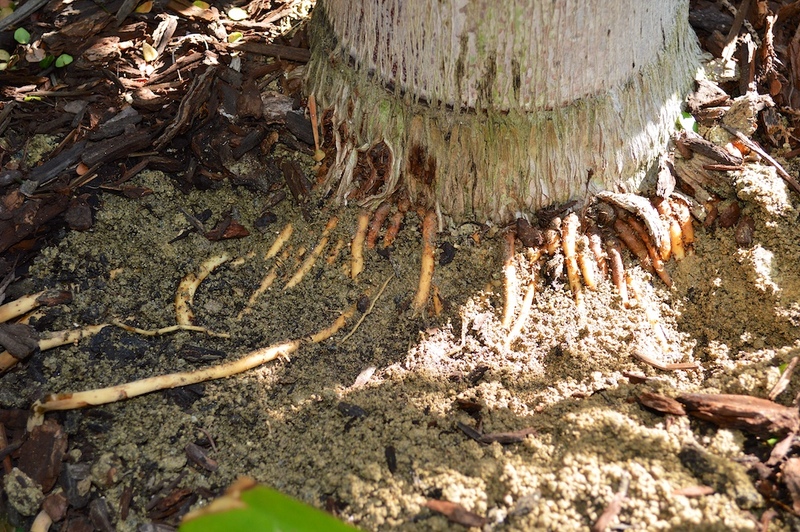 You will most likely find that after a few years your once air-girdled palm will develop exposed roots or root initials and need to be mounded once again. When in doubt as to what height to mound, err on the side of lower rather than higher. 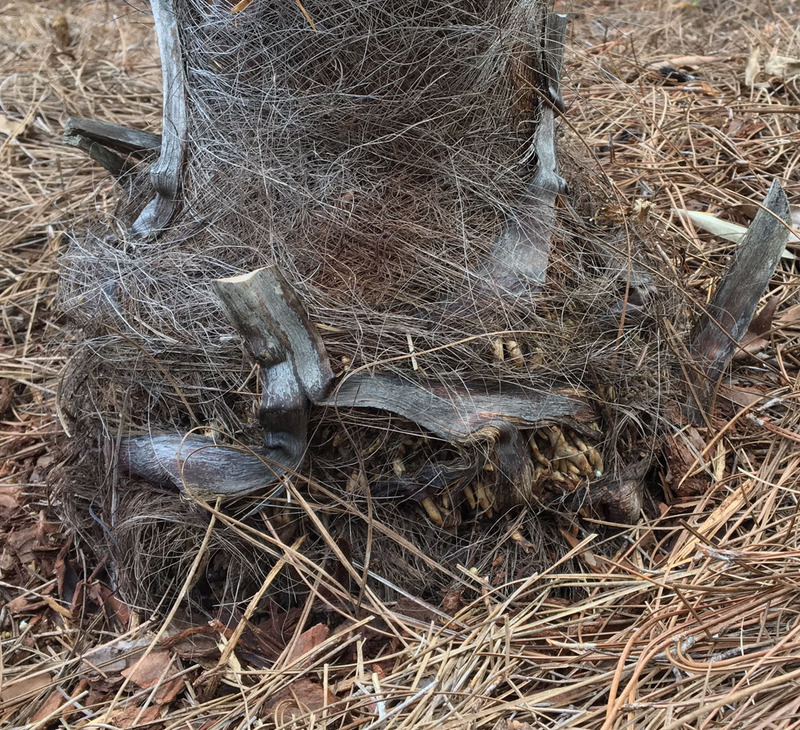 Mounding too high can lead to stem rot in some palm trees. So play it safe. Now for some proof. Here are a few examples showing the benefits mounding has provided in my garden. The first comparison is of an air-girdled Foxy Lady Palm. The palm below clearly shows air-girdling and also the beginning stages of an exposed root planting. 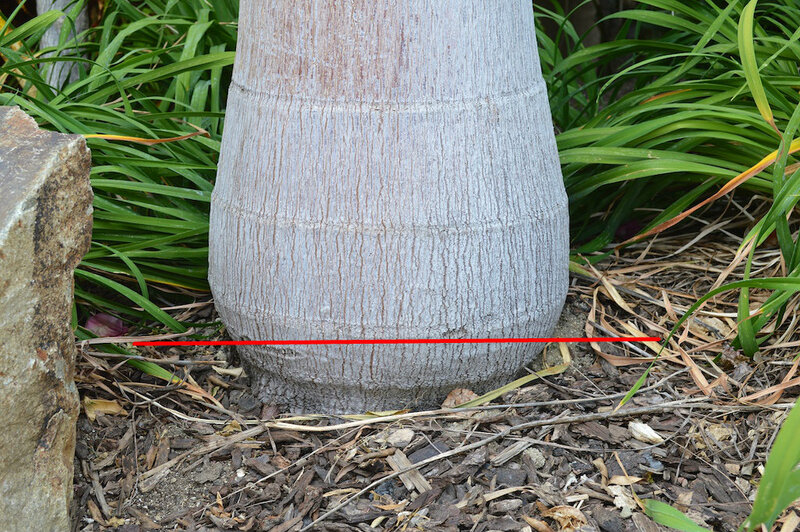 The red line diagrams how far up the stem I will be mounding this palm in the future. For comparison, about four years ago this Foxy Lady Palm below looked just like the one in the last photo. You can see how fat the base of the stem is now compared to the air-girdled palm shown above. Thanks to mounding, this palm is so happy that the “bark” has actually flared out. This is the direct result of the development of numerous new roots underneath it that had more soil to grow into. If you look closely you can see a few roots becoming exposed. I will actually be mounding this palm again with another few inches of DG and mulch. Earlier I wrote that stability in the ground is another of the benefits of mounding. 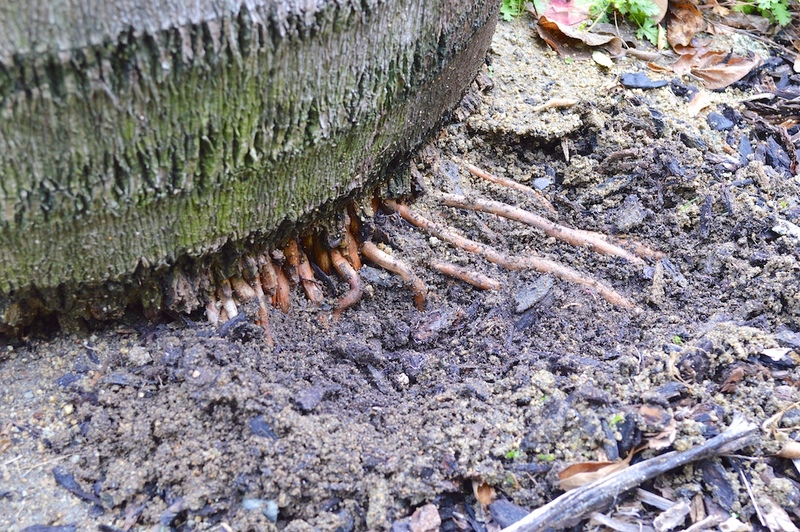 This stability from mounding comes from forcing the development of more roots to help anchor the palm into the ground. One palm tree that is notorious for being wobbly and easily blown over in high winds is Syagrus botryophora. A year ago my palm below was showing signs of needing mounding, as it had exposed roots and inactive root initials coming out the base. So I built up four inches of DG and two inches of mulch as the mounding layer around the base. Pulling away that mounding layer, you can now see the results. Numerous fresh new roots with many more developing. Only one short year ago I could rock this palm in the ground. It was that wobbly. Now it is so locked into place that it no longer sways in high winds. 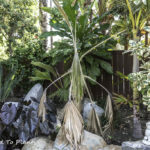 Here is the last example in this palm tree growing tips post to show you how well mounding works. This Roystonea regia had a slight air girdle showing three months ago. I put down some DG and mulch around the base and you can now see it has already started to develop new roots. These new roots can only benefit this palm. What are we looking for as an end result of the mounding process? 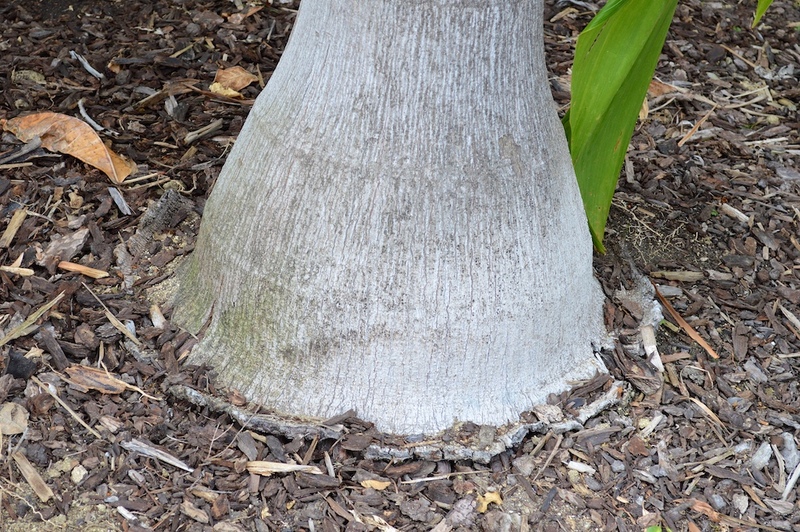 Something like this Archontophoenix alexandrae in my yard that is showing off the almost perfect shape to the base of a trunk of an ideally grown palm. This is what I consider an exemplar of palm growth from the third infographic at the beginning of this post. I mounded this palm two years ago and you can see how fat the base of the trunk is on this palm in comparison to the other Archontophoenix alexandrae I posted a few pictures up. Cheers. As you gain experience over time from mounding, you will learn what works best for you in your garden. If you have any additional tips or comments about mounding, I would love for you to share them below. Hi Len, we were speaking about this today, so I looked around to find this. I think most of the PT members and the like refer to “mound planting” as planting a heeled palm “high” on a mound as such, since it is bound to tiller down as it grows. Maybe Kim knew this post and coined what I referred to as “Volcano planting”. Either method surely sounds like a type of “mounding”.. do you have any posts on the planting of heeled palms high? Or do you believe in it? Bill, I don’t plant my heeled palms that way. I plant them like any other palm. I have had heeled palms pull themselves deep without any issues. I have dug palms from Mardy’s that were buried a foot or more deep past the heel. I don’t believe that heeled palms will commit suicide by pulling themselves down so people must in turn plant them higher than ground level. But that’s just me. Good day. I have no experties in palm trees and therefor my question… my 3 palms (just bought the house with the palms) are very close to the garden wall (less than a meter). It us a brick wall. It is short thick palms and they are very beautiful so want to keep them. Will they lift the wall when they grow ? Hi Mari. The answer is no. They will not, so you are fine. Palm roots do not expand like dicots. We just had five 6 foot spindle palms installed. I was worried about the poor condition of the rootballs on these palms which otherwise look healthy. But since your article said roots come from stem, I guess I should not be too concerned. Should the top layer of current roots have some exposure to air or should they be mounded to the level of the stem? Should they be watered daily for the first month? And when can or should they be fertilized and with which kind of fertilizer? I can send photos…. All roots should be covered. Depending on where you live, will decide what to use. Just use something free-draining. Spindles like water so if planted in a fast draining soil, they could be water every few days. I would use SuperThrive the first watering, which is great for transplant shock. Start fertilizing once the Palm looks happy and has had time to start rooting into its new home. We are in Tampa Florida. So no fertilizer for a couple months? Ah, Florida. Tha changes things. You could fertilize much quicker. Maybe few weeks. Some will fertilize soon after planting. I like to get roots going first. Thank you for this educational post! I have two nine-year-old Jubaeas that have air girdling, and I didn’t even know it until I read this. I look forward to learning more from you. That’s one palm teee that responds very well to mounding. I have a silver palm that’s very tall, well over my house. The mound has eroded but I don’t think any roots are visible, but it looks like there are aerial roots visible. I wanted to build it up about 6-8 inches at least and everything I’ve read elsewhere discourages building up around a tree. 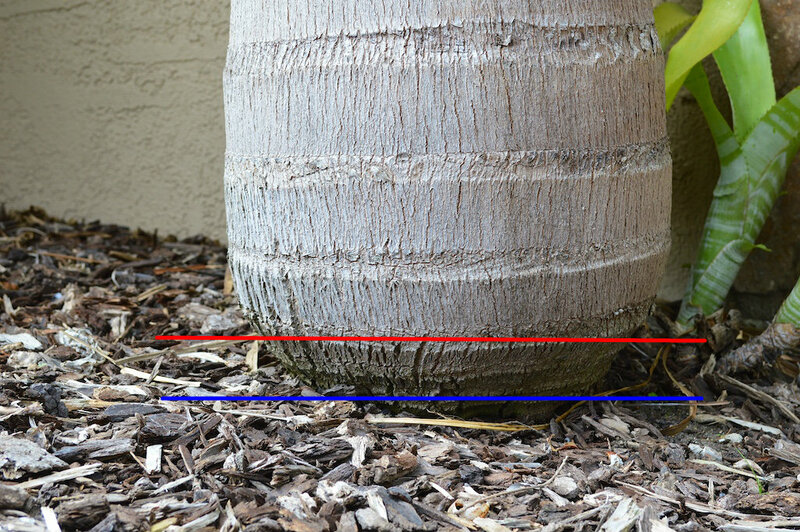 Is this different with a palm and do you recommend building a short retaining wall around the tree and adding dirt to the base? I think you will be fine as long as you use an airy substrate. As that break down and you see roots, you can apply soil. I am so glad I found this site. 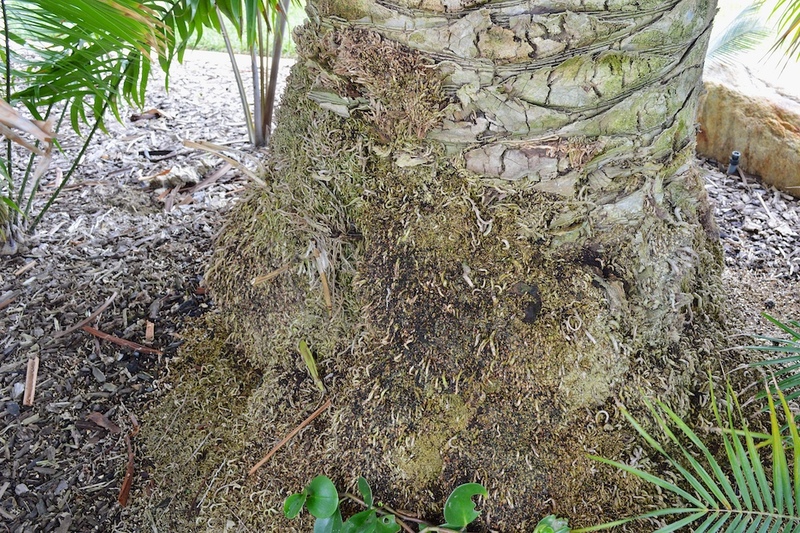 We just purchased a home in Tampa, FL that had a large Bismarck Palm that has exposed roots at the bottom. Someone working on our landscape lighting said he thought it was a result from someone weedwacking around the base of the palm when it was smaller. We have been debating if we should take it down because we were in fear of it getting too tall and not being stable enough soon. I’m hopeful now that mounding will help. Is there a way I can post a picture for you to see? I would love your opinion. You can email me a pic at info@marriedtoplants.com. Weed-eater damage is very real and I see it a lot with palms in lawns. I have some palms that are getting sick. They use to thrive with limited water. Last May I attempted to plant other things bushes and ground covering in the planter and they did not do well, the other plants died. Maybe it was the added water that made the palms health decline? I am going to send pictures to the above address. A few years prior one of the 5 palms in the planter died but I just figured it was sick. Now that the others are being affected by something I want to try and save them if I can. I tried to call a tree dr and the amount of $ he wanted, well was not doable. So I am trying to do my own research. Any and all help would be so appreciated! I live in southwest Florida. We just planted some Triangular and Areca Palms in the back yard. My concern is we may have planted with too much root exposure…just planted yesterday so its not to late to adjust. Should I cover the roots completely on both types of palms?? When do you suggest I start fertilizing? And with what? If roots are exposed, yes. I would. I wait a month or so to fertilize newly planted palms. However, things grow faster in FL, so maybe not wait so long. We just got a 7 ft clear trunk Sylvester palm and planted it in our front yard about 3 days ago. We have been giving it 30 galons of water every evening and almost all the branches have turned brown in these three days. We are in Florida where its about 90 degrees every day now. We don’t know what is causing it to turn brown since we have been watering it as recommended by the growers. Any insights on what can be causing this? And will those brown branches ever turn green again or do we need to cut them? I greatly appreciate any help ! Hi Elizabeth, I looked at the pictures you sent me and the tree doesn’t look healthy at all (same with the palm tree behind it in the picture). It is very hard to name a culprit in these matters, but hazarding a guess I would go with root issues. Is your soil clay? That looks like a palm growing in clay and that is getting too much water. Thank you for the article. In the case of the older Canary Island Date Palms that have exposed roots, how would one mound such cases, or is it necessary? I have a very old CIDP that has a large root ball with exposed aerial roots, about three feet high from the soil. Do you think it would be beneficial to the tree to build a raised planter around it bringing the mounding up around the root ball nearly three feet? Hi Karl, I wouldn’t find it nessassry to mound with a Canary. 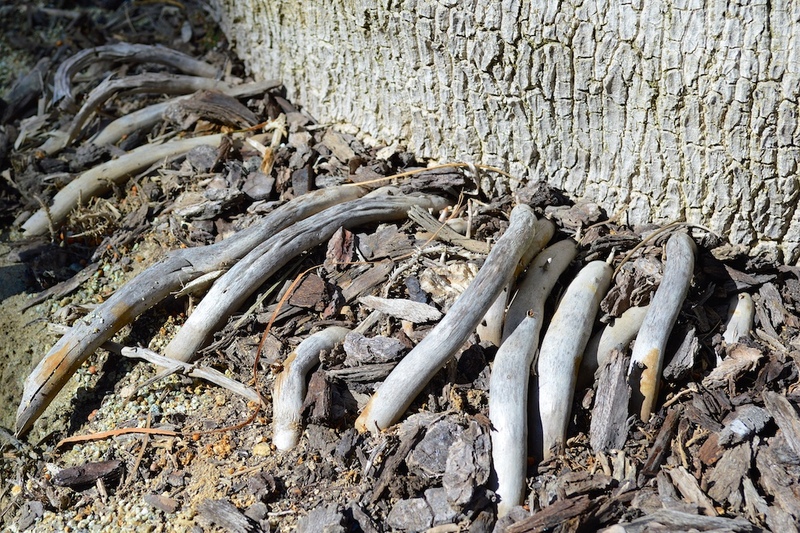 CIDPs make many aerial roots when they are mature. I’m wanting to back fill soil in a planter box I just built and I have some palms in there will it have affect on the palm if the soil is above the root levels?? I guess it depends on how high you are backfilling. If it is maybe 3-4 inches you should be fine. It is is a lot more, you risk causing trunk rot. Also depends on the plan tree. Is there anyway to send you a photo of my palm trees to get your expert opinion on what you recommend I do to reverse their root problem? I can do a quick look. Send to info at marriedtoplants dot com. I recently (yesterday) planted a Christmas palm. I had to dig into rock. Prior to planting I had dirt brought in and I created a “flower bed” on top of our rock area. 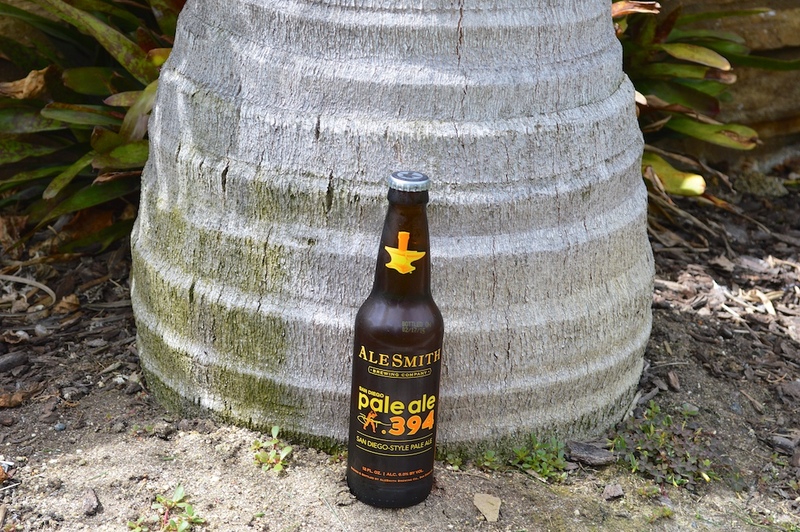 When I planted the palm I recognized I mounded the dirt to high up the trunk. I pulled dirt away to avoid the trunk rot. I was told to water daily for 21 days. Question is how much water do I apply and if I have water puddling around the base is that bad? Should I add dirt around the trunk and try to divert standing water? Thank you! Not sure on watering. Too many factors and you are in FL. But puddling water is usually not a good thing. If you add dirt, make sure it is very free draining. Would you mound this trachycarpus fortunei? It has roots about 4″ up on the trunk. This is a 8′ overall palm. Would just adding mulch be ok? Aloha, we bought a home in West Oahu. Our home is surrounded by a lava rock wall and Manila Palms stationed along the wall about a foot away. My husband is concerned the roots will damage the wall and wants to dug them up and put them in giant pots. Please advise. Depends on the wall. If loose rock, the roots could push the rocks. If solid, it won’t be an issue.